What does this rFVIIa treatment mean for you? NovoSeven® RT means speed, effectiveness and portability. It’s a recombinant bypassing agent that you infuse on-demand, and has a long history of helping people control their bleeds. What does NovoSeven® RT treat? 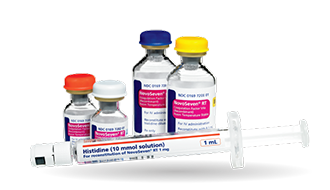 NovoSeven® RT is used to treat more types of bleeding disorders than any other factor product. What is the safety profile of NovoSeven® RT? The most common and serious side effects are blood clots. aIn people with hemophilia A or B with inhibitors. People who use NovoSeven® RT are talking about fast infusion time, and portability makes it possible to take their treatment along when they’re on the go. You may find that their experiences are similar to yours. Novo Nordisk Hemophilia Community Liaisons (HCLs) are here to answer your questions about NovoSeven® RT and connect you with resources to help you manage your bleeding disorder. I have just been prescribed NovoSeven® RT. I am considering NovoSeven® RT.